make it perfect: .A new pattern??? Who would have thought?!. .A new pattern??? Who would have thought?!. Certainly not me!! I'm usually not one to go against my set plans, and this pattern was not in my 12 month pattern design plan...but I just couldn't help myself. Too many requests from sewers out there for more boy pattens and after Uptown Girl was released I got lots of emails and requests for a similar style jacket for little boys. It just didn't seem fair that the girls could have a stylish jacket this winter and the boys had to miss out! Downtown Boy has been designed with trendy little boys in mind. 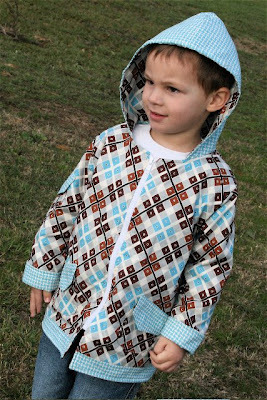 This jacket is sure to keep your little man warm during the cooler months, it looks great worn during everyday play and can also be dressed up for going out. Funky pockets on the front and sleeve of the jacket provide both practicality as well as masculine style. 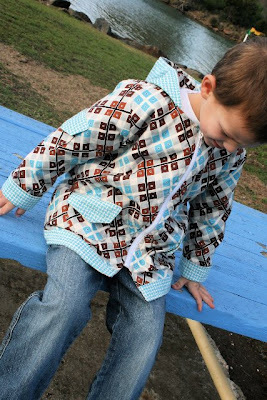 Downtown boy can easily be made reversible with the use of a reversible zipper resulting in two cool jackets in one! Anyways, I'm thinking this jacket is pretty cool. The boys in my household give it the thumbs up and I've even had my brother and brother-in-law request one in a bigger size for them to wear. I always worry when designing a pattern for boys that it is going to be too babyish and not appeal to older children, so I'm glad this one is appealing to big boys! The jacket is padded with pellon. It works really nicely, not too thick but still nice and warm. 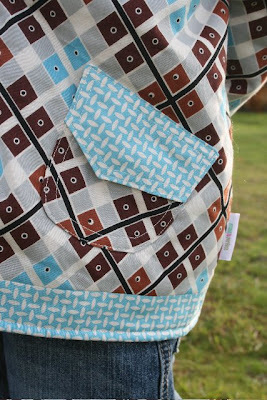 I've had a go using light-weight pellon (the blue jacket) and a thicker one (the brown jacket) and they both work really well depending on the warmth and look you are wanting. You could also use a home decorating weight fabric or cord and no padding for a lighter, warmer weather jacket. 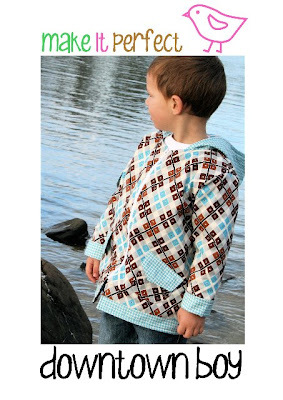 Downtown Boy can also be a fully reversible jacket. You just have to replace the jacket zipper with a reversible jacket zipper. Unfortunately in Australia I haven't been able to find anywhere that sells a reversible jacket zipper - can anyone out there help? I have seen them available in America though but can't see an online store to purchase them from. You could always go for a button closure option down the front if you aren't comfortable with inserting a zipper, but trust me, it is not as difficult as it looks. 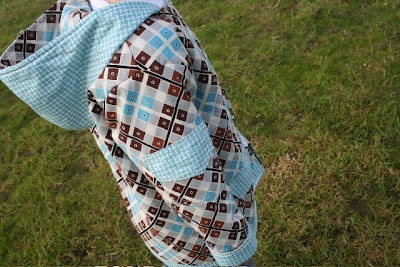 So, if you are looking for a fun, trendy winter sewing project for your little boy, then look no further! Head over to the Make It Perfect website to see more photos and check out the fabric requirements for Downtown Boy. If you would like to purchase a copy of Downtown Boy for yourself, they should be popping up in retail stores very soon. Ask your favourite store to get one in for you! Keep checking back...I'll get a giveaway sorted in the next few days! That is so trendy. Really like it in the brown. How did you managed to post at 7am?? :) Hope you wasn't up all night with that little man! Soooo cute Tone!!! 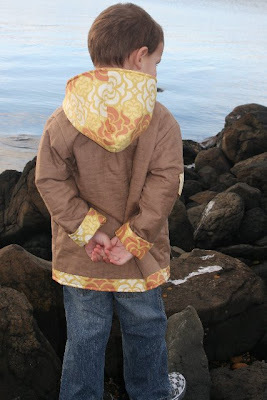 Nice to see more boy patterns - even if I won't be sewing one in the near future :) Did you take the pics yourself too? Nice job! Love it..its gorgeous. 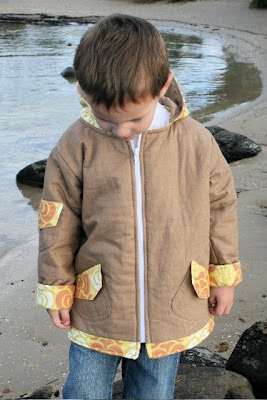 I have just finished a winter jacket for my little man but I will certainly buying this pattern for next year and by then I will have overcome my fear of zips! I can't believe you managed to finish the pattern with a newborn in the house..you are amazing! This is so great Toni. A very cool boys jacket! I love it. It is great to see the creative juices still flowing, as well as the milk. Is that apron pattern in the shops, I will probably, no definately just be looking at the front of the packet, and really kid myself, that one day I will actually attempt it. L.O.L. Toni, you are amazing. I don't know how you do it. You have just had a baby ... and you have the time and the energy to finish this pattern. Wow! 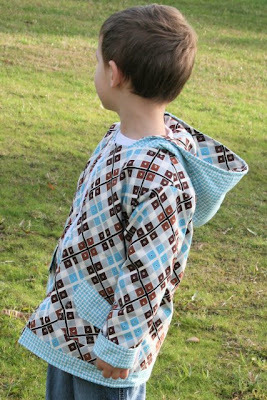 I would like to say that downtown boy is a great pattern and Ty said to say that arm pockets are usually for cigarettes and this could be encouraging the younger generation to start smoking (he didn't have the heart to tell you before the pattern came out!). I think that's a load of bull and oerhaos it could be useful for collecting shells or something like that. Love, love, love it! I noticed this pic on your facebook and was wondering if it was a new pattern..
Toni, if you are in need of some zippers I live in the USA and am coming to Aus for a visit in about 3 weeks and can buy you some if you need... I can try and track down here where they might be.... let me know. What a lovely jacked !! Very cute (or is that too much of a girlish word for this trendy little jacket). Love the name! Love it that the pockets don't have buttons. Too fiddly for little kids who want to get to things quick - great thinking Toni! Love it! I have had a few friends make the Uptown Girl jacket which is lovely, but too small for my daughter. But the Downtown Boy would be perfect for my son! Thanks for designing a great pattern for boys.